Before I dive in and tell you about these delicious cookies. . . .be patient! Let me take a minute to appreciate that sometimes winter is lovely. 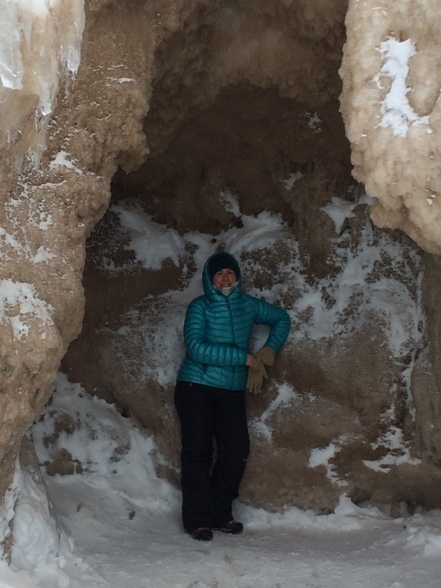 Especially when you are out in the cold exploring something new and beautiful like when Tim and I headed to Sleeping Bear Dunes National Lakeshore on Lake Michigan a couple of weeks ago to see the ice caves. Google the Lake Michigan Ice Caves. They are pretty awesome. 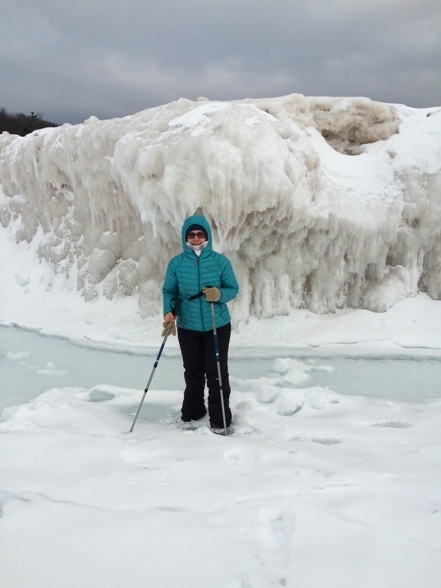 We hiked out on to the ice and then climbed around on the (very dangerous) ice formations. It was frozen solid while we were out there but it was very slippery. I recommend trekking poles and some extra grip on your boots such as YakTraks. You could hike along the fantastic ice formations and then suddenly. . . Cave! The ice would just open up and show you a cave. 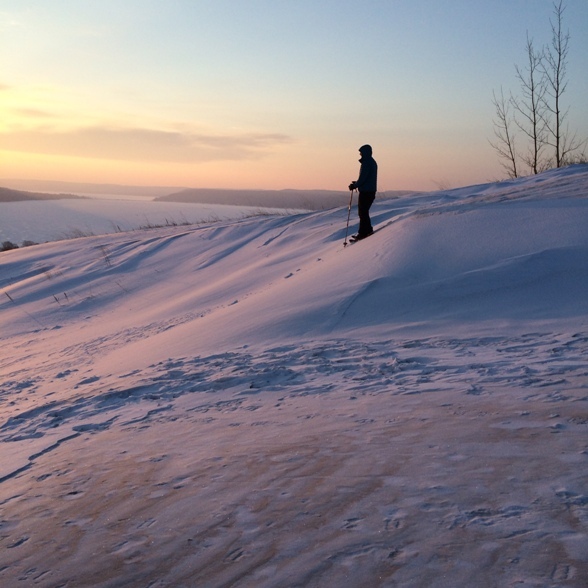 The other fun fact about winter is that the sand dunes are frozen and therefore a breeze to climb with snowshoes. We had a perfect vantage point to watch the sunrise over Glen Lake. Of course, spring is now showing her face and as much as I enjoyed a quick look at the ice, I won’t miss winter. 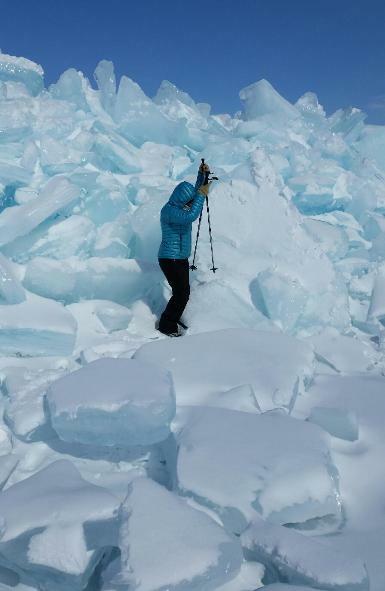 It’s warmed up enough now that the ice we saw is probably no longer safe. The caves are breaking up and melting back in to the lake. Welcome back warmth! Now back to your regularly scheduled cookies. Initially I just really wanted a chocolate baked good so I decided a quick chocolate shortbread would be just the thing. But orange goes pretty good with chocolate so I ended up throwing in dried orange peel. Tim and I dehydrate a lot of fruit and I happened to have dried orange slices so I ground some up to use in this batch. If Tim & I ever get lost in the woods while hiking those dehydrated orange slices could SAVE OUR LIVES!!! The survival guys on all those crazy cable shows could really benefit from a food dehydrator. Just sayin’. If you aren’t as freaky about drying fruit, dried orange peel is readily available in the spice aisle of the grocery store. 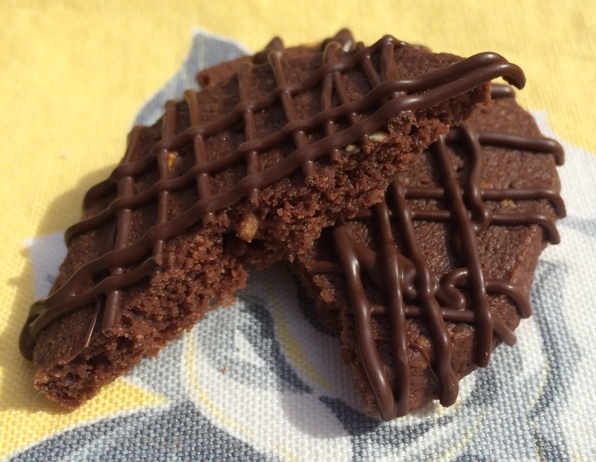 These are not a terribly sweet cookie but the added drizzle of chocolate really pumps the sweet up. If you prefer they can be drizzle-free. I like just about anything drizzled with chocolate though. Old shoes probably taste good with a chocolate drizzle. On a side note, Easter is Jell-O season at our house. Jell-O eggs to be specific. (You can buy the egg molds on Jell-O’s website.) I’ve eaten dozens of them so far this Easter season. I’m suddenly wondering if a chocolate drizzle would be good on all those Jell-O eggs I’ve been eating! Hmmmm. . . . In a large bowl beat the butter until pale and creamy. Mx in the powdered sugar. Once the butter and sugar are combined add the flour, cocoa powder, orange peel and salt. Mix until a firm dough forms. When ready to bake, preheat your over to 350. Unwrap the dough and slice into 1/4″ slices. Place on a parchment lined baking sheet and bake for about 12 minutes. Cool cookies completely. 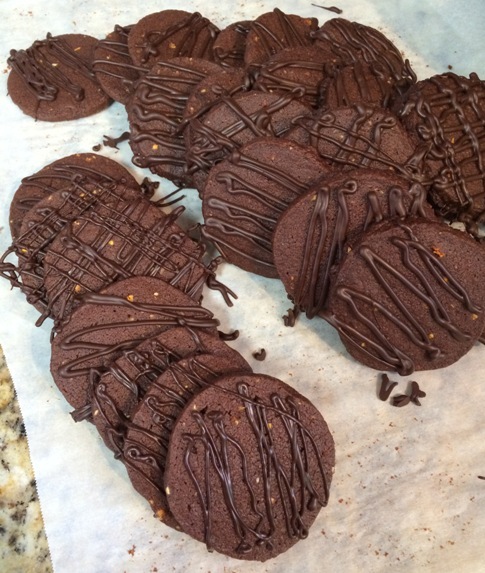 After cookies are cooled, melt some chocolate (I used about 1/2 cup chocolate chips) and drizzle on top of the cookies. 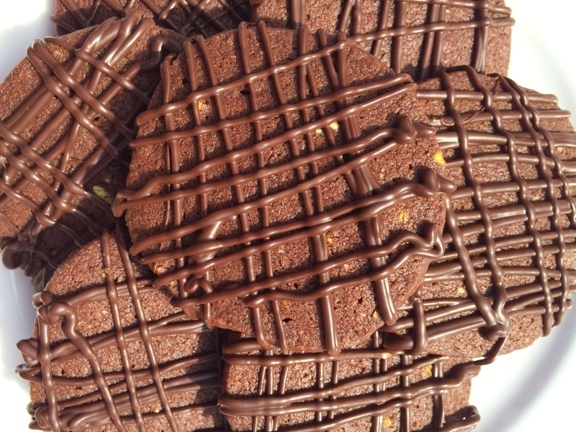 After the chocolate firms up, store the cookies in an airtight container.